For the newly engaged, planning a wedding can seem overwhelming. But before you fall down the Pinterest rabbit hole, first consider: are you looking for a simpler wedding option? 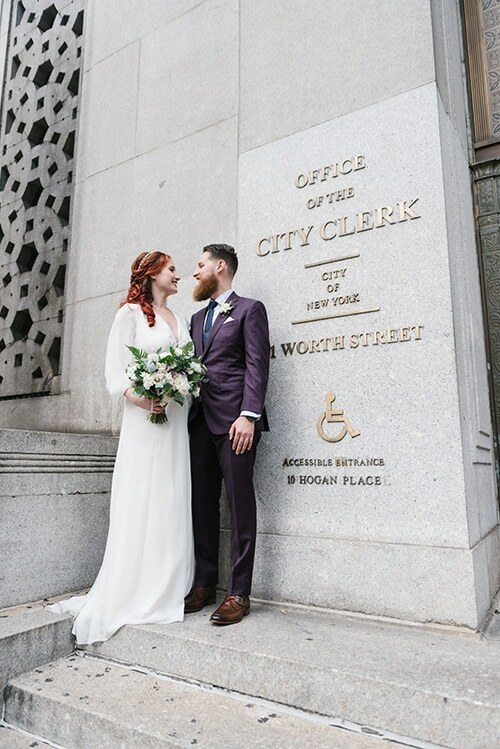 If so, you might consider a City Hall wedding — and as a photographer who has shot dozens of NYC City Hall weddings (and have happily become their de facto wedding sherpa in the process), I’m going to share a few secrets to having the easiest, most stress-free day. 1. Consider what’s important to you. If you’ve decided on a City Hall wedding, you’ve probably already narrowed it down to a small list of guests, right? Not necessarily. In the past, I’ve had couples bring dozens of loved ones to City Hall (because, yes, you can actually fit up around 25 guests in the Manhattan ceremony room). However, you’ll just need to be aware that the more guests you have, the more complicated planning will be. Some may consider this a fair trade-off to have your grandma and best friend from college to see you into wedded, while others may feel most comfortable for the personal “just the two of us” approach. Depending on where you plan to get married, there will be different guidelines, not the least of which will be forms you need to obtain, varying operational hours, and other logistical questions. A quick call to the Marriage Bureau should clear things up. 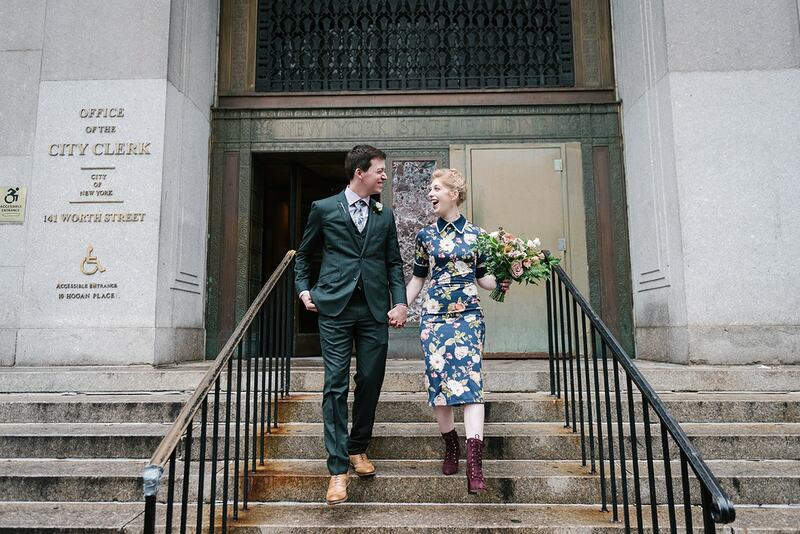 For those in New York, here’s what you can expect at an NYC City Hall wedding. When scouting vendors, particularly your photographer, ask lots of questions. It’s totally okay if you’ve just started planning your big day and don’t have all the answers; your photographer will likely be able to help you out with a lot of unknown factors, just by virtue of their experience with City Hall weddings. And not just photo-related questions, either — the wedding community is a tight-knit one, so we know florists and hair and makeup artists, we know where to get smoke bombs and streamers, we know what time of day has the smallest queue at City Hall. We’re a treasure trove of answers, so ask away! 4. Make choices based on what makes you happy. Sometimes my couples will ask my opinion: will this dress or this other dress photograph better? Should we bring props? Can we hit up four different portrait locations after the ceremony? Here’s the thing: as a documentary photographer, I want to capture the emotions of the day. I want you to wear and do whatever is going to make you feel like you’re absolutely killing it. Whether that means you’re trussed up in a flowing gown or a minimalist jumpsuit, carrying an armful of flowers or decided to go on a Pinterest binge with signs and confetti, I’m all for it. The only thing I will have a strong opinion on are factors that might negatively affect your photos, like lighting and time of day. Oh, and your comfort, too — if you’re planning on hitting four different portrait locations after the ceremony, I’m going to insist we stop for a cocktail and bite somewhere during that timeline (trust me, you’re gonna want to eat). 5. Select a photographer that gets you. As an NYC City Hall wedding photographer, I am keenly aware that I am the only stranger who will be spending the day with you. Sure, you spent a few hours with your hair and makeup artist, and maybe you made a few visits to your florist or tailor. However, I will be with you as you wait for your number to be called, I will be with you during your first kiss, I will be with you for the celebration afterwards. It’s very important that when you’re considering your photographer, you gauge their professionalism and energy. Do you feel like you’re in knowledgable hands? Do you feel like you’d have fun with them? Does their portfolio aesthetic speak to you? Do they have a good reputation with previous clients? Again, don’t be afraid to ask questions. This is an investment, and we always appreciate a couple who really wants what we offer. Thinking of having a City Hall wedding?